Pioneer CT-W208R STEREO DOUBLE CASSETTE DECK Tested Works Great Free Shipping! Pioneer CT-W910R Dubbing Cassette Deck - Super Nice! Dual easy to use full-logic cassette deck with Dolby B, C noise reduction. Includes Pioneer SR in/out connection, headphone output, and honeycomb chassis with twin motors for excellent quality. I have probably used it only about 6X. In good working order. Both decks tested. Serial # XE 115391. I cleaned the pots and bench tested it. This will make a wonderful addition to anyone's collection. This item is in Very Good Condition physical condition. Item worked prior to storage. No Cables or Remote included with this item. PIONEER CT-S88R. The best tape deck iv owned. Cd sounding quality. All buttons work perfectly tape plays perfectly. Cleaned out unit with compressed air and used head cleaner on tape heads. Dynamic range: 110 dB. Rare read, CT-W840R PIONEER Auto-reverse. double cassette deck DOLBY HX PRO B-C NR, Rare--Record Heads on BOTH decks for up to 4hour recording with RELAY and two 120min tapes. Dubbing tape to tape in high /reg speed. 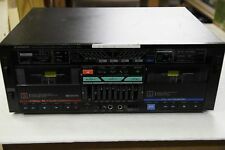 Pioneer Stereo Double Cassette Deck Model CT-W505R USED. IN A GOOD WORKING ORDER. Up for sale is Pioneer CT-W650R Dual Deck Cassette Recorder. Fully Tested Great Working Condition. Tested all playback functions work and records from deck A to deck B. Includes 2 sets audio cables and 2 new TDK 60 tapes. PIONEER CT-W205R Cassette Tape Deck Player Recorder Works Great! Free Shipping! (Photos do a nice job of showing condition.). Tested for Key Functions, R2/Ready for Resale. The right kne, upon pushing Eject, does NOT open. PIONEER STEREO DOUBLE CASSETTE. MODEL CS-1170W ORIGINAL BOX. (see all 8 pictures). This item is used and shows a little bit of wear. Unit has been tested and everything works on both sides. • There is a scratch on the face plate just above the tape deck. • Small scratches on the right face plate, just avove the “Rec Level” Knob.'. OFFICE USE ONLY: LL #18-24 . Up for sale is Pioneer CT-W600R Dual Deck Cassette Recorder. Fully Tested Great Working Condition. Tested and works like it should. Cassette Deck. Cassette Deck is Fully Functional. Pioneer CT-W404R : In very good, clean condition. Pioneer CT-W770 Stereo Double Cassette Deck in very nice condition. The system was tested, playing on both sides, recording at Normal and High speeds. The system works great. Unit is clean but the top does have two scratches. Pioneer CT-S200 Cassette Player Recorder Stereo Single Deck. Pioneer quality and reliability. Tight and responsive unit. Clean, presentable condition. Pioneer CT-W300 STEREO DUAL CASSETTE DECK DOLBY B, C Noise Reduction. Condition is Used. Shipped with USPS Ground. Works perfectly, Japan made, no issues. Up for sale is Sansui D-290 Stereo Cassette Deck. Shows normal signs of wear for it's age especially on top of the unit. Unit has been serviced and is 100% operational. PIONEER CT-S88R Vintage High End Tapedeck Wood Panel!! Mic: 0.25 mV / 600 ohms (2x 6.3 mm jack). Headphone: 0.25 mW / 8 ohm (6.3 mm jack). Dynamic range: 110 dB. Total harmonic distortion: 0.7% (0 dB). Number of inputs Number of exits Power consumption: 28 W.
The CT-W500 is equipped with the ability to play the best sound it possibly can, and auto reverses when your tape has finished. Auto tape selector. Cassette deck. Phones port. Synchro copy / relay play system. Pioneer CT-W404R Dual Cassette Tape Player/Recorder Auto Reverse (Discontinued by Manufacturer). Tape dubbing (normal/high speed). Deck 2: record and playback/auto-reverse. Trending at $33.90eBay determines this price through a machine learned model of the product's sale prices within the last 90 days. Good piece and hard to find! No remote. PIONEER CT-W300 Dual Cassette Deck Player/Recorder Works Great! Free Shipping! PIONEER CT-W300 Dual Cassette Deck Player/Recorde. Up for sale: Pioneer CT-W430 Stereo Audio Dual Cassette Tape Player/Recorder Please look at pictures for actual condition... Any questions please ask!!! Trending at $43.81eBay determines this price through a machine learned model of the product's sale prices within the last 90 days. Nice double deck, tested, works great. Pioneer Stereo Double Cassette Tape Deck CT-1280WR. Condition is Used. Shipped with USPS Priority Mail. This System Has Been Tested and Works Well. Good Physical Condition. Please See Pictures. Pioneer Twin Cassette Deck CT-W504R. Type: auto reverse, double compact cassette deck. Total Harmonic Distortion: 0.8%. Signal to Noise Ratio: 76dB (dolby C). Noise Reduction: B, C, HX Pro. Wood Trim (80). Add to Favorites. Vehicles (28). Personal Care (77). A Sales Franchise that is fun and profitable! Office/Franchise Training: Huntingburg, IN 47546. Collectibles (309). Automotive (64). Trending at $54.97eBay determines this price through a machine learned model of the product's sale prices within the last 90 days.